I’m not sure this is that bad. Though that font is pretty special and I always love it when they feel the need to inform me it’s a novel rather than, say, a work of journalism. For the usual Baen covers we get on here I agree it isn’t that bad. But if you were reading this is public people would defiantly give you a second, ‘what the’ look! The man also looks like he has a jaundice problem. Artist: I put him in a robe, I made his face old and wizened. I gave him a staff… what more could I do to make him look like a monk? I’m glad they specified “A Novel” on the cover…here I thought it might be a biography. I like the way that they’ve made BAEN BOOKS + serial number and price look like a hammer. And I like the way they’ve made the ‘L’ in ‘HEINLEIN’ into a backward tick. It’s like a bizarro-world tick! An anti-tick! It expresses not teacherly approval, but rather the complete opposite! Oh, St. Rubik! I marvel at your cube…and also the novels that reveal its secrets, one column at a time, but hey, I thought there were only 3 columns! I think the “L” in “Heinlein” has panache. Pizazz, even! Goodness, that font is pointier than the heroine’s profile in a PS1 game. Another excellent novel from the pen of the mysterious Roberta Heinlein. He’s directing traffic in a rennaissance faire parking lot. Green ye go, red ye stop! This book cryeth out for yon retroactive “font problems” tagge. I came across your website, I never thought I would find my cover art reviewed! 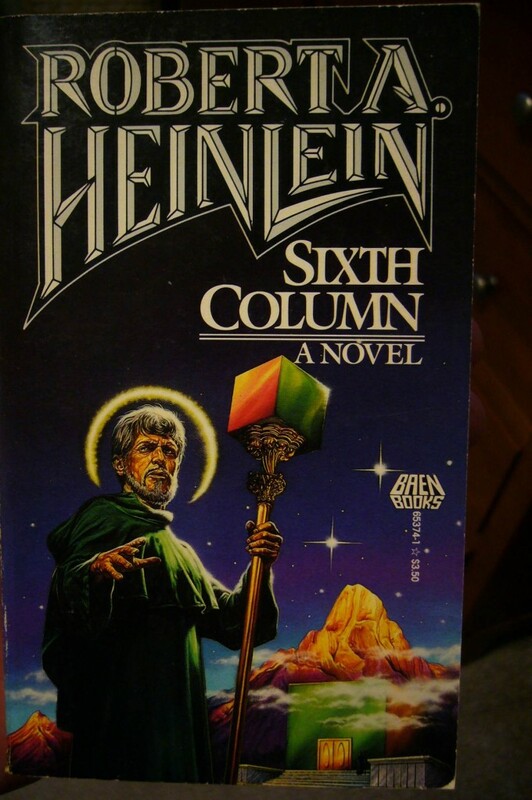 All the people making negative commments about the cover for Heinlein’s “Sixth Column” need to read the book, it would change what they say. In all my years of illustrating, whether for the Publishing, TV, Film, or Theater Industry I have always read the books or scripts before creating a concept that would capture the spirit of the storyline. My colleagues and I have never intentionally misrepresented a story. A lot of time and research is spent before a piece is created. During my time in illustrating paperback covers, the art directors and publishers trusted me with the concepts, casting and visual interpretation of the covers. As for title treatments and cover copy, I was not the creator for the Heinlein Series. I did create some title concepts for some of the occult novels. Most of the titles I worked on over the years, have sold extremely well, and in some cases have been reprinted. Please don’t misunderstand what our intentions are on this site. Read the “About” on the main menu and you will find that we love our covers and cover artists and marvel at the imagination on display here. And the fact your cover scored a 6.24 means we find it pretty darn good. To see how your cover art compares to what is truly “terrible” check out what’s in the “Top Ten” on the right. We appreciate your comments and welcome you back. Tell your colleagues we’d love for them to share their opinions too. We’re here to have a good time, crack bad puns, and sometimes even have interesting conversations. Take comfort in the fact that none of the comments thought your cover art was at all terrible. In fact the first two comments wonder why it was the cover of the day. The Baen logo got more criticism that your artwork. In fact if you look at the top comment for your other cover here for “Star Ka’at World” it pretty much says you painted a cover to match the book blurb! As Tag Wizard was pointing out, you’ll find no bigger fans of science fiction and fantasy and cover illustrations than the members of this little club. We are your biggest fans and just come here to have fun. May I add respectful dittos to the two above comments, and encourage your participation also.. One of the most fascinating aspects of this place is when we can talk about the distance between what artists think they are saying in their work and what actually gets read by the receiver, who crosses the abyss to engage the message—the question of intentionality vs. reception. I mean, it’s not your doing, presumably, but it really does look like “Roberta Heinlein” up there. You are to be commended for actually reading the book and accurately depicting the contents. Too many artists don’t. Compared to the truly bad ones we see here, yours is a model of excellence. The man has no anatomical problems and the laws of perspective are obeyed. Most of the badness of this cover results from that terrible font and title design, which we know wasn’t your fault. We’ve made fun of it every time it appears on that reprint series of RAHs works. The viewers’ eyes have been assaulted so badly by that, that when they get to your work, it’s got a hangover of awful. Same with the title and font of “Star Ka’at World”. I suspect that if we saw the original of this minus terrible title and Baen logo hammer, we’d think “That’s rather striking.” I tried covering up all the words on my screen and the chap does catch your eye and exude power. Thanks for stopping by to teach us! @GSSex – I dunno. I’m waiting to hear what Ben thinks of this cover. @Raoul: I think we scared him off. What with having standards and all. And him not understanding the concept of “font abuse”. Not enough cleavage on this cover for him to approve of. A month later, probably no one will see this! Thanks for commenting… I always get nervous when an artist finds us joking here. Makes me feel like teacher has found us out. But everything the guys say is true, you won’t find fans truly passionate about fantasy/sci-fi art as everyone here. In fact I bought this book purely for the cover and is in my collection. A good post to check out is some comments from another Baen artist Larry Dixon. This is why we can’t have new friends come over and play here.